For a full seven weeks, the majority ethnic Chinese community in Singapore throws their biggest party of the year, bar none. Chinese New Year represents a time for family togetherness, prayers for prosperity, and pulling out all the stops for dining, shopping and partying, mainly focused around the Chinatown ethnic enclave. As a visitor, an immersion in Singapore’s Chinese New Year represents one of the most authentic local experiences you’ll ever have the pleasure to enjoy on the island. Bring the rest of the clan, too, for this family-friendly cultural experience. Chinese New Year in Singapore kicks off in the ethnic enclave of Chinatown, particularly along Eu Tong Sen Street and New Bridge Road. The Chinatown Chinese New Year Celebrations transform the island-state's traditional Chinese enclave into a riot of lanterns, street stalls, and performing arts, with celebrations extending as far as Marina Bay. Look forward to a few key events of the season: a Street Light-Up, a Festive Street Bazaar, Nightly Stage Shows, and the Singapore River Hong Bao. Chinese New Year Street Light-Up in Chinatown. Key streets in Chinatown - Eu Tong Sen Street, New Bridge Road, and South Bridge Road - will be lit up with traditional Chinese lanterns and colorful street lights while street performers and acrobats (not to mention the inevitable lion dancers) liven up the lanes. The Singapore University of Technology and Design (SUTD) participate annually in the design and construction of the Chinese New Year Light-Up. For the “Year of the Pig” in 2019, SUTD presents a piglet-themed light-up, enhanced by lanterns and carps illuminating Chinatown’s streets. The Opening Ceremony takes place on January 19, launching the light-up that will stay in place till March 6. Chinese New Year Countdown. Ring in the Chinese New Year in Singapore's Chinatown, as you join the locals and local celebrities alike with firecrackers and fireworks going off all through the evening. For 2019, the Chinatown Chinese New Year's Eve Countdown Party takes place on the evening of February 4, along Eu Tong Sen Street and New Bridge Road, from 9:30pm to 12:30am. Nightly Stage Shows. Local and overseas cultural performance troupes take the stage, exhibiting traditional Chinese performances like martial arts, lion dances, and Chinese opera. Come to the Kreta Ayer Square, next to the Buddha Tooth Relic Temple, to see acts unfolding every evening. For 2019, the stage shows ran from January 18 to February 4, beginning at 8pm and ending at 10:30pm. Singapore Chinatown festivities for the Chinese New Year are headed by the Kreta Ayer-Kim Seng Citizens' Consultative Committee (KA-KS CCC). More information on their official site: chinatownfestivals.sg. Singapore's Chinatown will host more than four hundred stalls selling traditional foods, flowers, Chinese handicrafts, and customary New Year decorations. Have a go at barbecued sweetmeats, waxed duck, and cookies served fresh on the street, or pick up some traditional Chinese New Year decorations to remember the day by. The Lunar New Year bazaar stalls line Pagoda Street, Smith Street, Sago Street, Temple Street and Trengganu Street within Chinatown, from 6pm to 10:30pm, extended to 1am on Chinese New Year. For the 2019 celebrations, the Bazaar ran from January 18 to February 4. The Bazaar is just the cherry on top of the shopping sundae in the island's Chinese ethnic enclave. Find out more about Shopping in Chinatown, Singapore. And read about Singapore and its place in Southeast Asia’s street food cities. The "Hong Bao" derives its name from the traditional red packets of money given by older Chinese to unmarried younger relatives during Chinese New Year. Nightly cultural performances and traditional Chinese artwork can be enjoyed outdoors, and giant lanterns fashioned after popular Singapore landmarks loom larger-than-life. Have your name written in Chinese calligraphy. Get a Chinese zodiac reading of your birth date. Explore the River Hongbao's food street (more on Singapore's cuisine here: Ten Dishes You Should Try in Singapore). Or just watch the nightly Main Stage Shows unfolding on the Float, featuring local performers and foreign talents. If you want to get into the swing of Chinese culture for the duration of the festival, the Hong Bao is the place to be. Admission is free. Visit the River Hong Bao - Official Site. "Chingay", in its Hokkien equivalent, translates to "costume and masquerade". 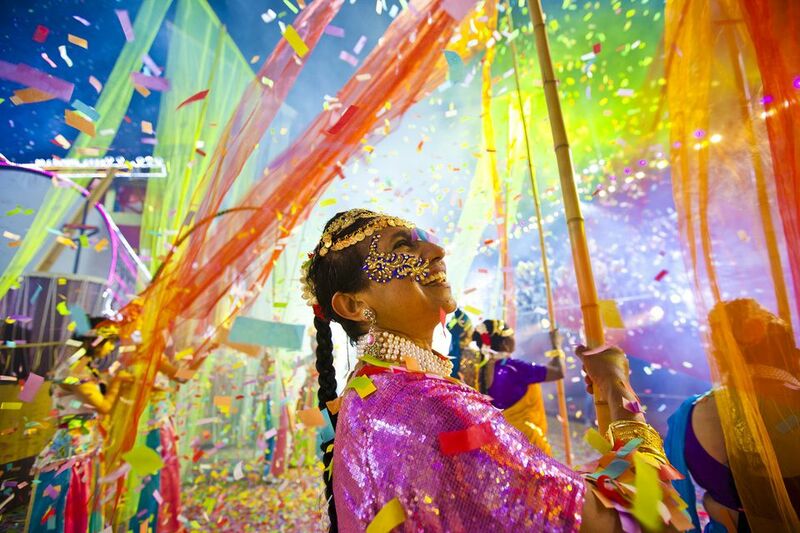 The normally staid Singaporeans take Chingay to its more colorful and musical extreme every year during the Chingay Parade, a two-night street party and parade that marks the climax of the Chinese New Year celebration. The parade is now proudly international, growing from its purely Chinese traditional roots to embrace more than 150 local organizations and thousands of performers, with international performing groups from China, Denmark, Indonesia, Sri Lanka and Taiwan. The Chingay parade route takes place in front of the Formula One Pit Building against the backdrop of the Singapore Flyer and Marina Bay. Parade participants will ride on floats, or walk in the procession, offering a riot of color and noise that few other Singapore festivals can equal. For 2019, Chingay will take place at the Pit Building from February 15 to 16; a separate Chingay celebration will be held in Chinatown on February 17. Chingay tickets can be purchased from SISTIC (sistic.com.sg). Tickets are also available at Singapore Visitors Centre at Orchard Road and Singapore Pools Outlets. For more information, visit the Chingay website: chingay.org.sg. For a look at what to expect as a spectator, check out our article about the Chingay Parade in Singapore. Transportation: The Chinatown-centered festivities can be very easily reached by MRT - simply alight at Chinatown MRT Station (NE4/DT19). To get to Chingay and the River Hong Bao, you can go to Marina Bay by riding the MRT and disembarking at the Esplanade MRT Station (CC3), Promenade MRT Station (CC4/DT15), Raffles Place MRT Station (NS26/EW14), or City Hall MRT Station (NS25/EW13). For more on Singapore's convenient commuter system, read our article on Riding Singapore's MRT and Buses with the EZ-Link Card. Accommodations: For accommodations closest to the Chinese New Year festivities, you can consult our lists of Budget Hotels in Chinatown, Singapore; or check out accommodations closer to Chingay with our list of Riverside Singapore Hotels.